Too frequently, the daily news includes stories about discrimination and violence perpetrated against lesbian, gay, bisexual, transgender, intersex and queer (LGBTIQ) people around the world. The images may range from bruised and bloodied faces in Jamaica to men being thrown off buildings in Iraq to the reported 689 murders of transgender people in Brazil from 2008 to 2014, reflected on a map. Civil society organizations like OutRight Action International (Outright), formerly the International Gay and Lesbian Human Rights Commission, have advocated for the human rights of LGBTIQ populations around the world for over 25 years. Yet, it was not until 2008 that the United Nations General Assembly first discussed LGBT rights. In the proceeding years, with persistent advocacy, there has been steady progress. Most recently, a U.N. forum honoring Human Rights Day focused on the cost of LGBT exclusion -- co-organized by OutRight and Human Rights Watch (NGO members of the coalition of 18 countries known as the U.N. Core Group) -- along with the U.N. Office of the High Commissioner for Human Rights. For the first time ever, the president of the General Assembly addressed a U.N. forum on LGBTIQ issues. In opening remarks, H.E. Mogens Lykketoft made it clear that members states are obliged to protect the human rights of LGBTIQ people. Educate people ... to respect one another, no matter the differences that distinguish us one from another. Taking steps such as these will enable member states to enrich people's lives. It will see them fulfill their international human rights obligations and ... help them to reap significant economic dividends. The forum, The Economic Cost of Lesbian, Gay, Bisexual and Transgender Exclusion, focused on a World Bank report by economist Dr. M.V. Lee Badgett. The report quantifies the cost of workforce discrimination, increased health costs and anti-LGBT laws, which can cost a nation up to 1 percent of its Gross Domestic Product. Applied globally, a conservative estimate of this impact (0.05 percent) amounts to over $400 billion -- enough to eliminate extreme poverty globally -- a preeminent goal of The United Nations 2030 Agenda for Sustainable Development. Anti-LGBT discrimination in the workplace lowers the productivity of LGBT people, which lowers the contributions their labor makes to the economy. LGBT people who live in homophobic and transphobic nations experience more negative physical and mental health outcomes, which increase health care costs to society. LGBT youth who experience harassment and violence in school and/or at home are more likely to drop out and become homeless, often during a critical transition to adulthood. This reduces their potential productivity for the rest of their lives. Anti-LGBT laws carry an economic cost of enforcement, diverting resources that could be used to increase the productivity of the economy. International investors and businesses are less willing to invest in a country that does not support fundamental human rights for all people. These fundamental factors were further explained in a new video released at the forum by the UN "Free and Equal" campaign, titled The Price of Exclusion. OutRight also released the final video in its "Cost of Exclusion" LGBTIQ Africa series. Dr. Heintz emphasized that while Dr. Badgett's findings will provide additional support for U.N member states to change their anti-LGBT laws and policies, there is intrinsic value to protecting the human rights of all people, regardless of economic consequences. Panelist Kasha Jacqueline Nabagesera, director of Freedom and Roam Uganda, put a face to the economic data. 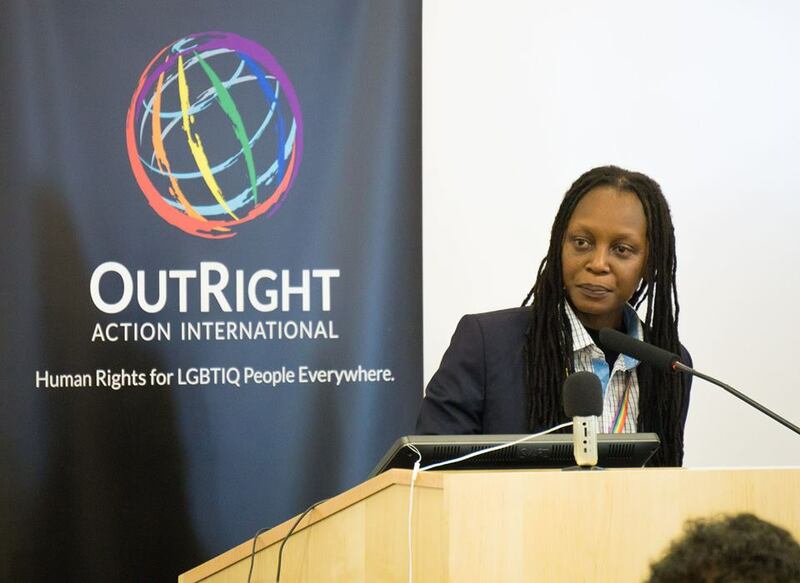 Through sharing her own personal story as a lesbian living in Uganda, Kasha highlighted personal economic effects, such as the cost of repeated evictions from home and long-term unemployment, and the affects on families, many of whom need to flee their country in order to be safe. Kasha challenged decisions by nations and humanitarian organizations to reduce international aid or boycott Uganda or other nations based on homophobic laws and policies. "That causes a backlash to our community," she said, "if you single out such a group of society as a condition to suspend aid." Rather, Kasha encouraged other tactics to hold governments accountable while supporting LGBTIQ populations, such as through direct connections to civil society. "For example, most of us human rights defenders are here today because of OutRight Action International," she said. "Try to work with some of our partners in the West to support us on the ground."